Those of you that are old enough (like me) probably remember “Hogan’s Heroes”. It was one of those old sit coms that I couldn’t wait to watch each week. The show ran for six years and you can still catch some of the episodes in syndication. If you have watched the show, you probably remember one of the stars, the German officer in charge of the American POW’s. His name was Sargent Schultz. The plot of the show was Hogan’s bunch (the POW’s) was always pulling something at the POW camp. 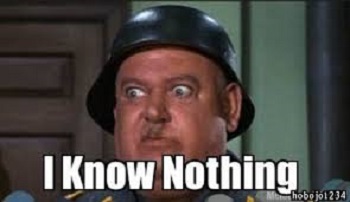 Even if Schultz saw the improprieties that the American misfits were engaged in, his line was “I Know Nothing”. It was a great show! That line, “I Know Nothing” is reflects my knowledge relative to the near term directional movement of the market. I struggled for years buying every indicator, every course, attending countless workshops, even working with “self-proclaimed” gurus and I still could not get consistently profitable. I always assumed I was missing something, needed more education, more courses, or more webinars. I was always trying to be “right”. I finally had an epiphany and discovered that over the long haul trying to be directional correct was at best a 50/50 proposition. I concluded that I needed to quit trying to be “right”. I needed to be profitable. I needed an “edge”. The challenge for me was to rethink my trading methodology. The biggest challenge was not realizing that I needed to change my methodology but to toss out over ten years of accumulated education. When you have spent so much time and money in an effort to perfect your trading only to find out the technical analysis was not delivering the anticipated results it is very hard to “chuck it all”. But that is what I had to do! As an alternative to trading directionally I was introduced to selling volatility (premium), more specifically extended volatility. By selling volatility when it was in the upper end of the range I found my edge. And now my results were quantifiable and predictable! By changing my methodology to becoming a seller of volatility I have a winning percentage in the upper 70 to low 80 percent. What is even more shocking is that I am directionally wrong more than I am directionally right. Go figure! “I Know Nothing” and I really don’t need to. I am often wrong on picking direction and have materially more winners than losers……but I am consistently profitable. If you would like more information on this methodology and how it could improve your results, give me a call @239.272.3424……I Answer My Own Phone!